Edited 1 time(s). Last edit at 04/02/2014 03:36PM by ForwardZion. Man, I'm glad I picked mine up when it first came out for around $10. I picked up a copy on ebay a couple months ago for under $75. Unfortunately the seller did not package it well and the record arrived with a crease through one side of it. I paid $80 each for used copies of Eaze the pain and Gracious mama Africa about 3 years ago. Found them on Discog, also spent about the same for Jubilees of Zion and Seek Knowledge. just a comment on the album cover..
i am curious why all brown/dark peoples are portrayed as barely coming out of the cave.. while the euro guy is in modern attire.. that whole scene really plays into the mindset of 88 types who think of the 'mud races' as backwards.. never progressing.. while the euro is the only one intelligent enough to advance. Rossta, I just picked up a copy of Jubilees at the Midnite show in Boston the other night for $15. Haile said it was one of the last copies they had. Sorry to hear you paid so much. 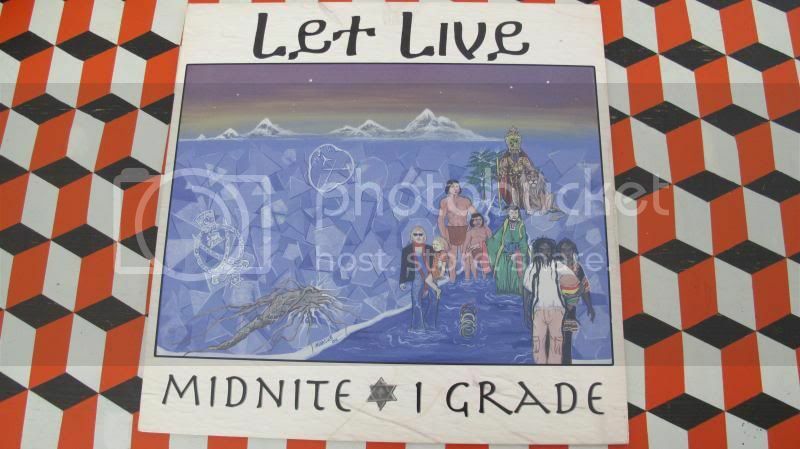 Man Ras TanTan, I have never seen them available at a show and they have been sold out online at midnite's website ever since I found Midnite in 07-08. They are original copies and money is just money, very grateful to own every midnite album. Two albums I want that I would pay $100 for are Sabbattical's Heart Ah Joy and Ikhaba's Troddin to zion. Never heard them and I want to so bad. Rossta, I got both those discs. The original album of ikhaba and I think a burned version of sabbatical. Funny thing a buddy of mines relative produced that album, total coincidence I was at there house and his aunt sighted my locks and asked if I knew sabbatical, cause her son had produced the album! All of this talk above had me check my Lps and I got Let Live and nemozian rasta on vinyl, with very likited playtime on them. i saw it as representative of different peoples, headed by the title, Let Live....found it pretty powerful and i did not feel what you did. I thought the rastas looked the most comfortably dressed, and hence the most comfortable and true to themselves. The euro guy looks freaky. The indians are dressed for the weather they lived in. That overdressed guy in the background look uncomfortable, and uptight. And it looks like he's got a codpiece. Nuff said. Perhaps you're being a little too sensitive on this one. Hey you seem to be keeping up with Midnite's latest realeses. What album do you recommend the most from the last 2 years? The new I-Grade release Beauty for Ashes sounds real good, what about Lion out of Zion? Hard to keep up with these guys! Check out Be Strong, much different from any other Midnite album. You might also enjoy Children of Jah. I have enjoyed Lion out of Zion, but have had Beauty for Ashes on a much heavier rotation. The show in Boston was one of the best and most energetic shows I've seen since my first at SOB's in 2005. It was professionally videotaped so I'm sure the footage will be up at some point. Vaughn teased "I must Say", I think the only song I've ever heard them play off Children of Jah. They brought the energy down so low at one point that when they stopped playing, and the entire crowd was silent. I don't remember all the tracks they played, but many that they usually seem to play. I know they played Ras for a Reason, amongst I n I ->black mambo, Ras to the bone, live the life you love, bushman, meditation, kaaba stone. Jah-N-I opened up for them. I got to the show later than expected and missed Ras Jahred M.C. & the H.O.R. Nyahbinghi Isis this time around. Exactly what went through my mind! Been hunting for their albums ever since I bought Ras Mek Peace back in like 2000. Nemozian Rasta still one of my all time favorites, had a hard time finding a second copy of that one a while back. @reggabe, beauty for ashes is a solid release as well as children of jah as recommended by rastantan. Boston show must have been nice! re: the "Let Live" artwork...I would say, seems that the reference is more specific in the context of the "Lion rules the Jungle", over ALL Nations, as in over all the Nations of Peoples descendant from Noah's three sons, Ham Shem and Japheth; and these representative depictions of the Nations are not judgemental; hence the title of the album: "Let Live". RasTanTan recommended some great albums, I would say if you don't have Kings Bell, you must add that to your collection, also I really like Free Indeed! Lion out of Zion and Beauty for Ashes are must have's though IMHO. With all due respect that album sounds like a squeaky wheel. To each his or her own. Anyway I'd rather run Queen Omega, Queen Ifrica, Hollie Cook, Alaine, Cecile, macka Diamond, or any other female who voices on Euro riddims. To each his or her own. Gladly dumped that album for cost right after I bought it. Definitely not in line with the spirit of this music. Oh my! Wish I had bought all this stuff when it came out. Because I would have no problem at all kissing it goodbye even for msrp. I am not a big fan of V.I.Reggae music, but I do enjoy Ikhaba. He did a tour of the U.S. with Dezarie a few years back. Not sure who was in the band.......but they sure fit the musical style of Dezarie & Ikhaba. For me it has been the best live V.I. Reggae I've seen/hear. I caught this tour in St. Louis, Missouri and then a month or so later at SNWMF. If there should be any V.I. Reggae @ SNWMF I vote for.....Ikhaba and or Dezarie. I feel that! But like strikkly said "To each his or her own"... kinda strange though. Edited 1 time(s). Last edit at 04/09/2014 04:12AM by Knowledge Seeker. Serious! The consistent cultural vibes, positive vibes and unity amongst artists is an inspiration. I love pressures new tune VI so nice, says it all!